Of all the spaces in my house, the front porch is my favorite place to make seasonal changes. 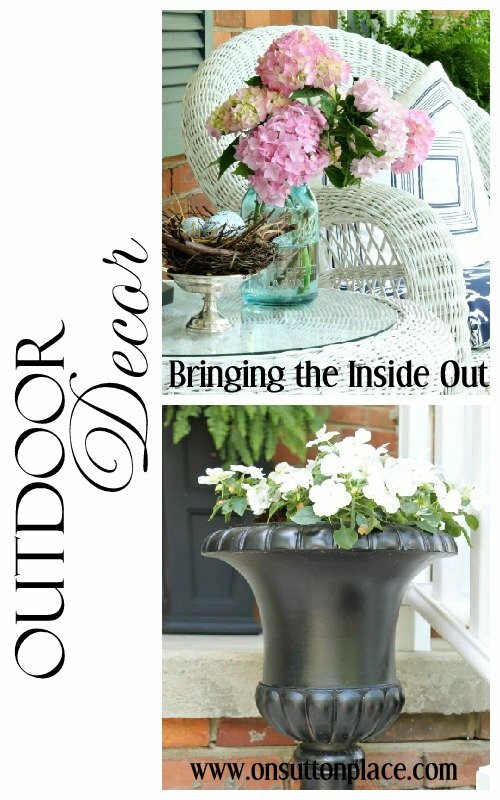 Outdoor decor has come a long way just in the last few years. Bringing the inside out is the best way to make an outside space livable and usable. What’s the first thing you put in an empty room when you are thinking about decor? Maybe a rug but for sure furniture. So that’s what I did on my porch. I have chairs and a table…but I didn’t stop there. I added cushions, pillows, a lamp and accessories. These things are the base for decorating any room and I use them outdoors too. Don’t be afraid of what the weather will do to your decor. If something gets wet…it will dry. Promise. 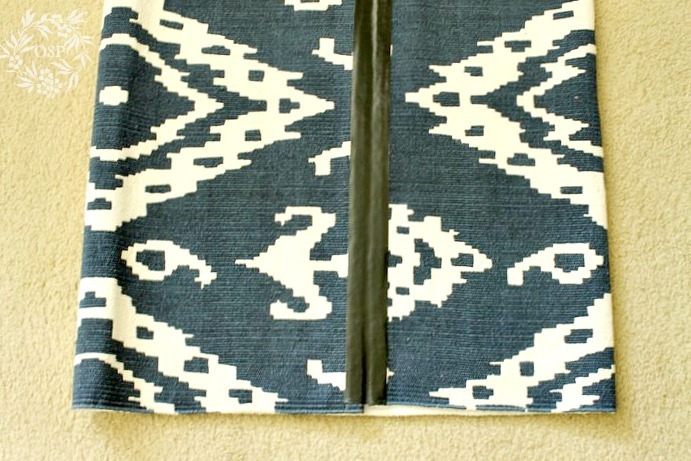 I covered my gold cushions with this new Robert Allen outdoor fabric called Baja Toss Marine. The pillows were a TJMaxx find last summer. I’ve had the wicker furniture for 20 years so I think it could actually be referred to as vintage…maybe not but close! I’ve considered painting it something other than white but always talk myself out of it. With white wicker I can do anything I want in regards to color and decor. It just doesn’t make any sense to change that. Which leads me to something I only figured out in the last few years. Start with a neutral base and add color with accessories to any space you are decorating. If you use this method, you are never backed into a corner or limited in any way by your color choices. I’ve had various plants in these black urns but I’ve found that impatiens does the best. The porch gets morning sun so they get big but don’t totally fade in the afternoon. I looked for a new door mat but couldn’t find exactly what I wanted. I had this rug from last summer but it was too big to fit between my planters. I laid it right side down and folded the ends in to meet in the middle. I used my handy Gorilla tape to hold the ends in place. I put together the door wreath almost totally from items I already had. The wreath looked like this just a few months ago. I left all the white flowers and the monogram. I added the flags from my 2012 patriotic door basket. I found some red foam star stickers and stuck them on the monogram. I have a feeling I may regret this when I try to peel them off! So all in all the only money I spent for the entire porch was about $20 for the new cushion fabric and a few bucks for the star stickers. I opted for ferns in my tall patio planters. It’s been a year or two since I used ferns and honestly I think it’s my favorite look. So easy. This look can carry the porch all the way to fall. I may switch out the door wreath for something else after July 4th. 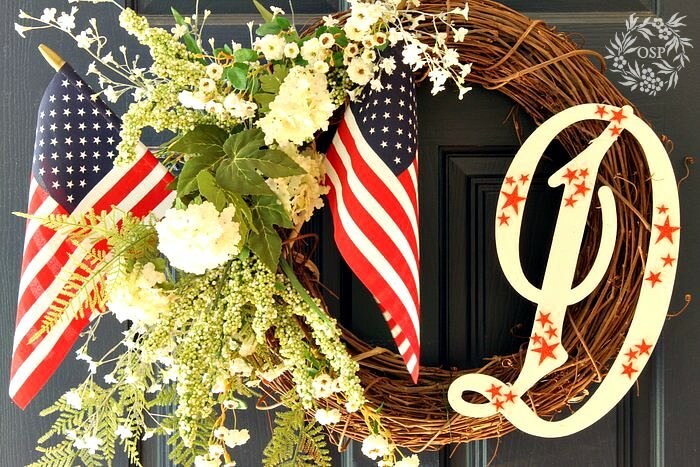 I can pop this wreath back on the door for Labor Day too. Just discovered your blog via Pinterest. 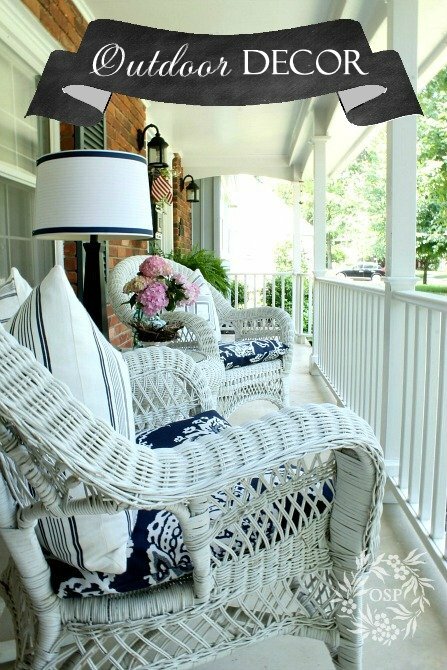 Love your porch decor; looks so cozy, yet elegant. I like the wreath too. Tell me something, please. 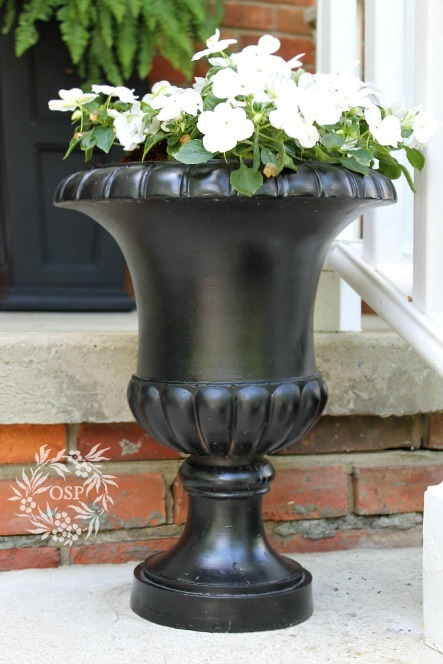 What paint did you use for the black urns” I’ve been wanting to do that but my urns have soil in them, so guess in late Fall, I should dump my soil and spray paint them. Do you put a sealer on them as final coat. I can put them in the garage over the winter. My siding is light grey, have brick front and burgundy shutters. If I painted them the color of the front door and shutters, that would look nice as long as the planter is in front of the grey siding but it would fade out and not be as visiable next to the red brick. What about white instead of black? 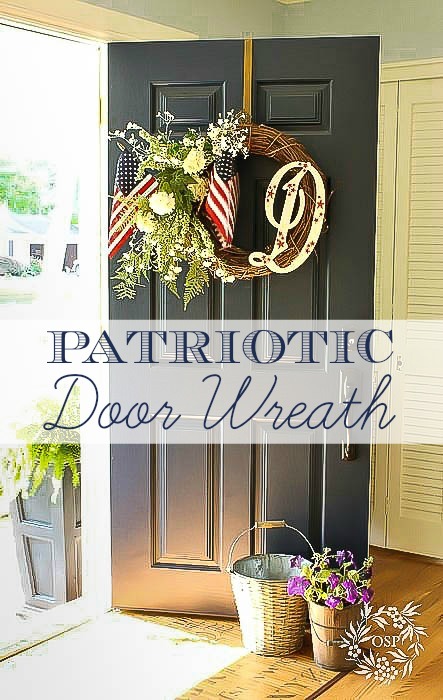 Doesn’t that grapevine wreath scratch your front door paint finish every time it is opened and closed? Love your porch, Ann. It’s truly picture perfect! This is an absolutely gorgeous space! I was thinking of putting a lamp on my covered porch as well…did you use just a regular lamp? I have seen ones in Ballard made just for outside spaces with covered bulbs, but they are so pricey!! Yes that lamp is from Lowe’s. It’s just a regular table lamp! I love your porch! 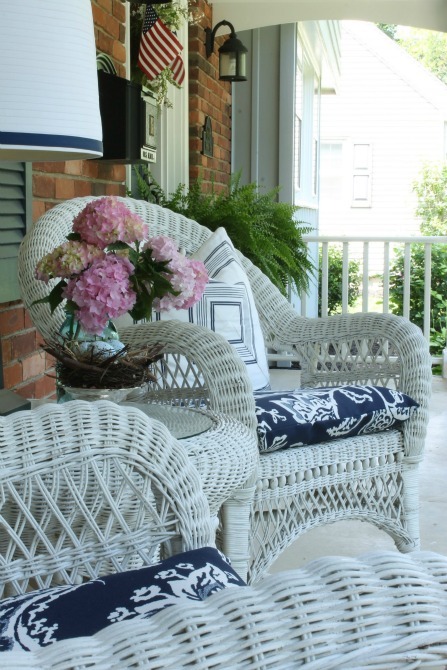 You’re so right about keeping the wicker chairs white, they will always be in style in white, too. I adore your wreath!!! I tried to make one yesterday, but I think it will get a makeover real soon. Canada Day is July 1, a good time to put together a red and white wreath, I think. 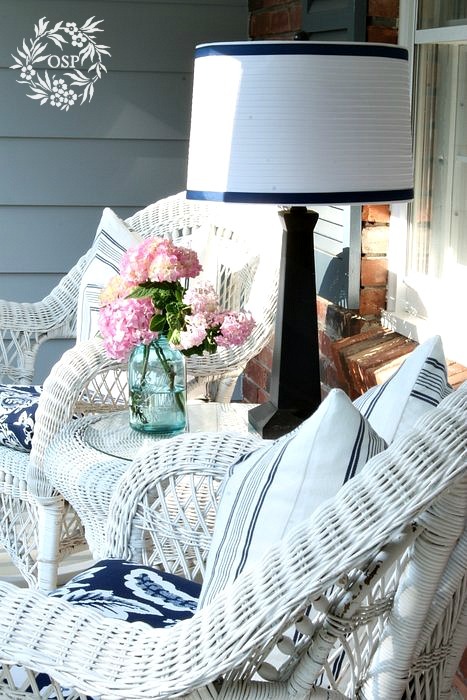 The lamp on your porch looks fabulous, all in all, a beautiful porch! I love your welcoming front porch! It’s so beautiful and thanks for the reminder that everything will dry. :-) I tend to forget that sometimes. Love your wicker too! Your porch is gorgeous! I can see myself sitting there with my girl friends drinking sweet ice tea! Ann, I can just imagine you sitting on your wicker chair, with your laptop blogging away! Your porch is a very warm welcome to your home! Everything looks so beautiful Ann, as usual. Love the rug. I hope you and the family are doing well. 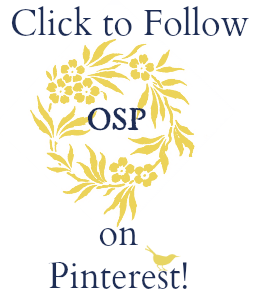 I am trying to get back into the blog, I’ve missed it and everyone. I’ll be seeing you! So pretty, Ann! 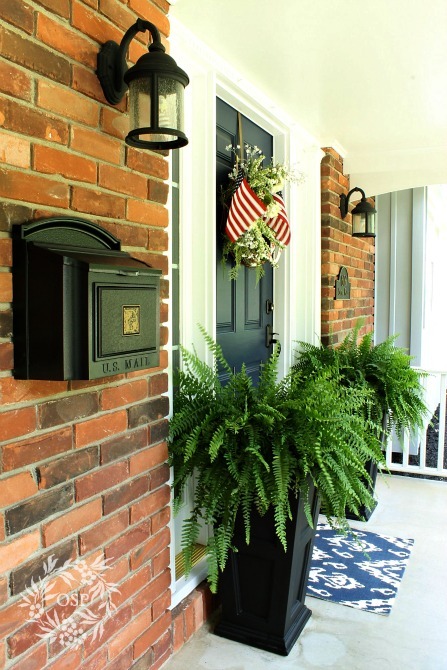 I love the blue and white, especially with black added like in your planters and mailbox. The fresh cut flowers are a great reminder to add them to an outdoor seating area even when we have potted and garden flowers for that extra bit of interest and colour. 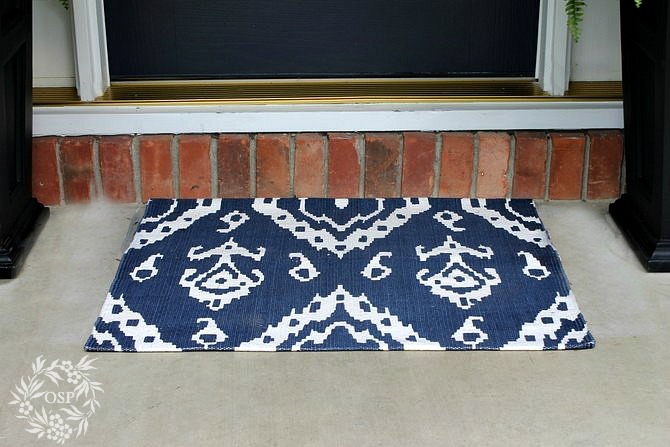 The navy and white colours on your porch look great with the brick and are a nice change. I agree that ferns are just the thing in your urns – they look perfect. If you can’t get the stars off your wreath you could always paint them gold and use the monogram letter for Christmas. Everything look so welcoming. Beautiful, Ann. You always do such a nice job with the details. I love ferns almost as much as flowers, they have such a laid back, summer feeling to them. Your wreath is gorgeous as well as the urns with the impatiens. Since we have a lot of shade, I use them a lot. They dry out quickly, too, so it’s nice to have them near the door so you can give them a drink with the watering can! Your front porch is so beautiful and looks like a very comfy place to spend time!! Love the fabric on your cushions. Your porch always look so beautiful! Ann, your porch is gorgeous and so inviting! 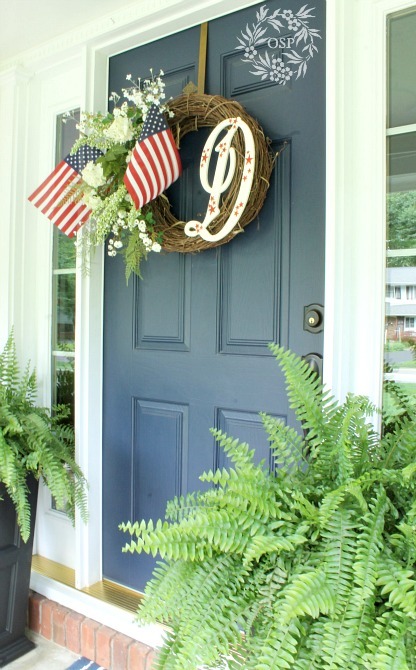 I love the fabric that you used on your seat cushions, and I pinned your wreath to my July 4th board! That was quite a trick you used to make the rug fit. Glad you did because it looks great in that spot! Your porch is one of my favorites and particularly this year, you are using one of my favorite color combinations. Black and white and blue all over!! Great job Ann and I agree the ferns are perfect!! 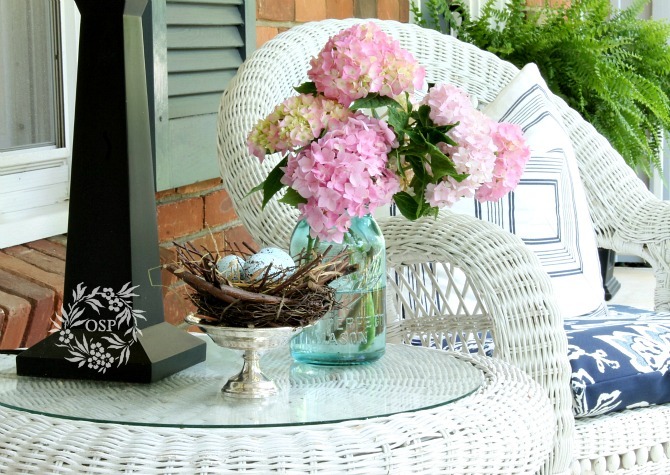 Your porch looks great – would love to sit and have a lemonade! Hit the button by mistake yikes! Love the ferns. That is a plant I always forget about. Your front porch is just beautiful! I love the blue and white combo. I sure do love your porch – what a perfect place to slow down, enjoy the oxygen and drink a lemonade. Your hydrangeas are most lovely! Ann, your front porch is so inviting. I may have to visit and bring scones. I tried hosta in my two white planter boxes this year. Saw the idea on Pinterest, but I like your ferns better. My boxes are not tall. Are the pink hydrangeas from your garden? I have one ready to bloom. Yes, Ohio’s weather today is PERFECT! Yes the pink hydrangea is mine. I only have a few blooms but hopefully soon I will have bunches! Thanks Diana! Hope you are having a wonderful time…enjoy every minute. Oh, how I’d love to sit on this porch awhile! I love every single thing about it, especially the navy and white accents. Love,love,love your porch ! Beautiful wicker chairs , love the new cushions ! Your porch is just pretty as a picture. I love the fabrics you used for your pillows and that rug is almost to nice to walk on. It makes me want to grab a glass of iced tea and join you on the porch for a visit.